I had so much fun doing my week of Aussie manis a few weeks back I've decided to do a week of Valentine's mani's in the lead up to Valentine's Day. Here is the first design I came up with. For this design I wanted to do something that wasn't pink and didn't include hearts. I settled for an accent finger stamped using the diamond stamp from Bundle Monster plate BM09, using Sally Hansen Canary Diamond Chrome, over Ozotic 621. 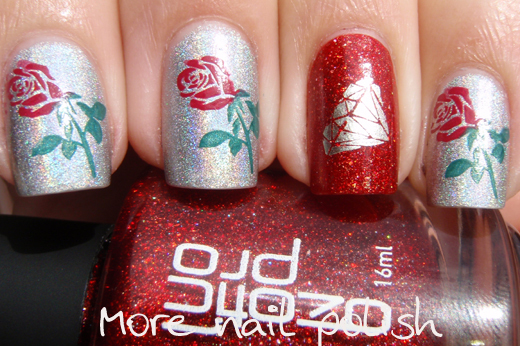 On the other fingers I wore Layla Mercury Twilight as the base, stamped with an ebay purchased plate with a rose, that I double painted in red and green for the roses. For the record folks, Layla Mercury Twilight holo does lose some of it's holo effect with Seche Vite top coat. Not as much as these photos would lead you to believe though, there was no sun and I took these photos outside. That's all folks, I'll be back tomorrow with another Valentine mani. This is so cute! 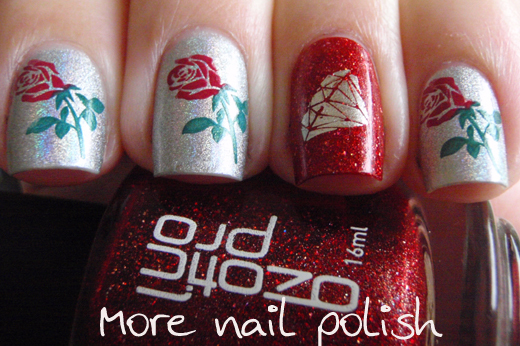 :D I love the roses!! That is really cute! I like how the colors in the stamps echo the background colors of the opposite nail(s). Makes it seem very cohesive, and really cute! ooooouuuuu thats so pretty i just love it! OMG OMG OMG OMG! This is just beautiful. 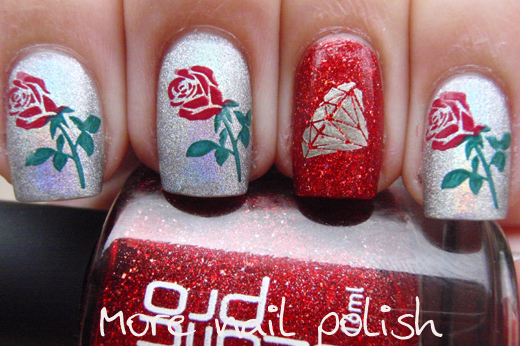 I might have to do some red and silver/white holo nails soon. SO pretty! I love the two toned roses! 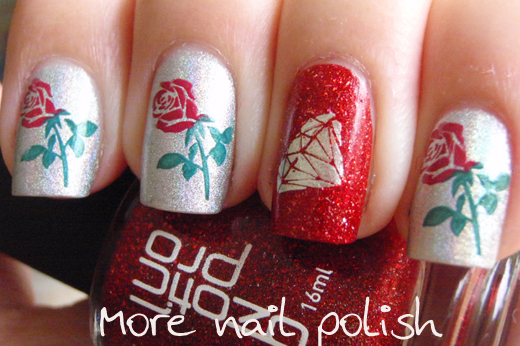 Your stamping is perfect! I had so many failed attempts of valentines manis on the weekend. That looks great! 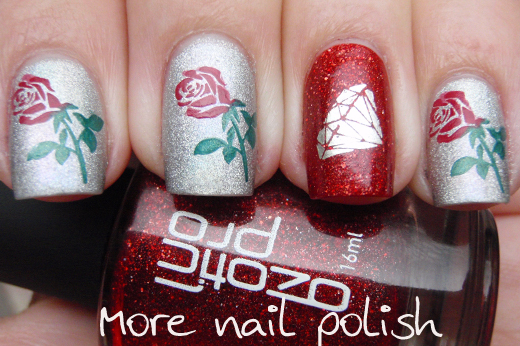 I especially love the diamond over the red!